The XBee-PRO 900 RF module is ideally suited for low-latency point-to-multipoint networking applications. Capable of point-to-point, peer-to-peer and point-to-multipoint networking, the XBee-900 is ideal for solutions where RF penetration and absolute transmission distance are paramount to the application. **Note: **Some users have found that the XBee-PRO 900 cannot be used with the XBee Explorer Regulated. One workaround is to change the TX and RX pullups in the XCTU software to be enabled. Or you can bypass diode D1 on the Explorer. Note: Due to the manufacturer's restrictions in other countries, we can only ship these to the USA and Canada. Sorry world! can XBee Pro 900 RPSMA & one I got on mouser connect to each other? I am trying to go through this tutorial: http://www.ladyada.net/make/xbee/point2point.html with this specific radio and for some reason there is no pan id option in X-CTU. Also it won't respond to the AT commands when using picocom after i issue the +++ see the OK then wait a second. Are these different from the regular XBee modules? They are definitely different than the other regular X-Bee modules. The pins have different signals assigned to them, and the modem has its own unique AT command set. So if you're using X-CTU you need to make sure you choose the matching XSC-900 modem and function set. There is no PAN-ID option as they're not really meant for mesh networking. Or maybe it's just confusing because they refer to "the XBee-900 XSC" in the description but not the product title? That is the actual product. Digi has at least 3 different firmwares, or firmware modes. The low power series 1 xbees (which is the only one adafruit sells) is raw 802.15.4 based. This module is a proprietary network that uses a 64 bit ID instead of a short address or PanID. As far as I can tell it does NOT use a coordinator, just mutual routers. Point to point and hopping are supported. It's a bit confusing as it seems to be a cross between raw 802.15.4 and Zigbee (with the disadvantages of both and the advantages of neither ... to quote P.D.Q. Bach). They also offer a TRUE Zigbee firmware, but NOT in the 900mhz band. I'm not sure there is anything in the Zigbee spec that says it can't apply to the 900mhz band. Firmware Version: 8062 but not worked.There is no response by XCTU when it tell to press reset. then I tried to recover XBEE which was working and detected by XCTU and successfully recover using same procedure. what should I do to recover first on both are new. please help! Hi everyone! I'v bought these modules and antennas (http://www.ebay.com/itm/291035154823?_trksid=p2059210.m2749.l2649&ssPageName=STRK%3AMEBIDX%3AIT). Test results showed that the urban range is 40m. There were 2 or 3 walls between modules. Is it ok? or my antennas don't suit xbee modules? Hi all, Iâve knocked this QT library up http://anthonypocock.github.io/QTXbee/ to help interface Xbee Digimesh modems with a project Iâm working on. Itâs working very well so far for what I needed and I hope it will now be of use to someone else. The code is set up with an example implementation. Iâm very happy to add features or make changes if needed or alternately please contribute directly on github. Most of the restrictions are generally due to governmental restrictions on RF ranges being allowed to be used by the public. It is a huge hassle and we do understand your frustration! Hopefully you can find a different supplier quickly that will work for your local area. Digi no longer recommends this product. It has been superseded by their 900HP product which I can say first hand is an excellent product, especially its Digimesh networking. I have 20 of these nodes in the field for 6 months now spread out over 500 acres and they work very robustly. There is no question the 900HP is worth the extra $3. Mark Holler, Camalie Networks. Which kind of antenna do you have attached to them? What kind of terrain/vegetation are between your nodes? Is this thing support full duplex ? Can these be used as rx/tx for a remote controlled project? Initially the project will just need controls (similar to any regular RC car), but soon after, I'll be incorporating sending sensor data from the RC to the "control station" at certain programmed intervals (as well as on demand when necessary). It's basically a mobile sensor platform that will move from point to point, stop, gather data, send data, and wait for commands on where to go next. LOS range of minimum 1 to maximum 5 miles is ideal for this project. Would these be a good potential solution, or is there something else that might be better in/around this price range? Anyone have any experience with these in an RC project? I cant get my Xbee Pro 900 to communicate with X-CTU without hitting the reset. I have the Xbee on the Sparkfun Explorer USB (https://www.sparkfun.com/products/8687). Solutions i have tried: Forcing the USB to supply at least 300mb. resetting the Xbee to defaults by way of holding the resets and once prompted for device from xctu i attach the xbee to the board and the device is written to by the X-CTU software (all complete and successful) . Nothing has worked. I check the device through the Terminal and when "+++" is entered it returns "OK." rather than "OK" (notice the extra ".") . Is this normal? I have posted on DIGI's website but no one has responded to my questions. I have other issues but need to resolve this before moving on. I solved it. Dumb mistake. I had the parity set to SPACE. This is probably a dumb question... but, if the data rate of these is only 156 kbps, then is there a benefit to running this at 38400 rather than 9600 or even 4800 or 2400? OK, I just answered my own question so I thought I'd reply here. I was mistakenly adding a "k" into the baud rate thinking that 9600bps was actually 9600kbps. So the answer is, at speeds less than 156kbps, the baud rate is the limiting factor, not the speed of the radio transmission. 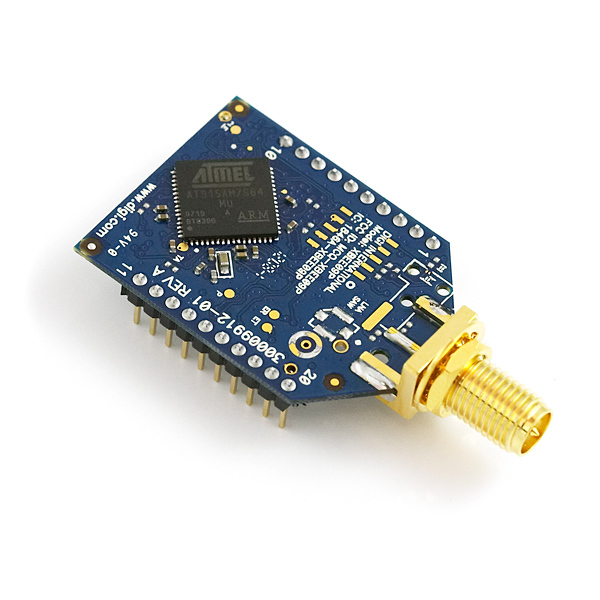 I just bought two of these and two 2.4GHZ modules as well as the necessary boards to use them. I tested both at 9600(the default) and they worked as expected. Then I changed the 2.4GHz to 38400 and they worked fine. But, when I tried to change the 900Mhz to any other speed, I just get garbage. I have tried everything from 9600-57600 and only 9600 works. Has anybody else experienced this? Well today I tried to change the 900MHz to another speed again and it worked just fine. Not sure if the earlier problem was mine, the wiring, the terminal I was using, or just some upset electronics gods. But it works now so I'm very happy. I wrote a simple sketch to try and measure the range. One arduino sends a number to another arduino which then replys back to the original arduino all over these xbees. I was able to get about 300 yards on ground level but that also included lots of power lines and buildings and trees so I'd image it'd work better under ideal conditions. I notice from the Digi website that these modules are certified in Australia. Are you able to ship these to Australian address' at all? Does anybody have any hints to getting this working? I set it up to work in transparent mode, and I can download Firmware onto it using X-CTU. When I try to communicate with the Xbee Pro 900 wire antenna version I don't get any responses. I have set them up to be on the same hopping channel and same Pan Id so I'm not sure what else to do. NEED TO KNOW THE COST TO THREE UNITS. When mating an antenna to these XBees, does it matter if the antenna impedance is 50ohms? 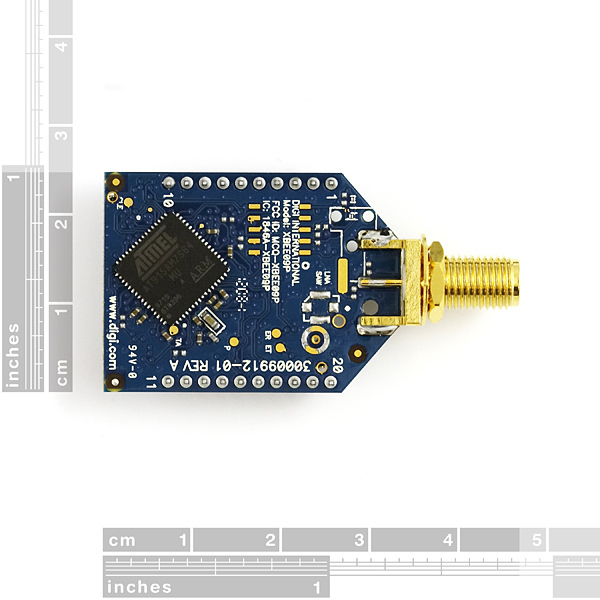 I want to use this antenna (http://www.l-com.com/item.aspx?id=20230) or something similar, with the ruber duck antenna sold below in the related products, on the other Xbee. Also check if you are using the newer version of USB Explorer board, the older one had a 150mA regulator on-board while the XBee Pro requires around 250mA. Less Current = Severe Reduction in Range! I don't think you can get 10 miles, but you can get 6 miles (10km) with a high gain antenna. Also the ratings are for line of sight ideal conditions and unfortunately real world is never ideal. when I got my xbees neither of them had the rpsma connectors like they should have I was sure that I ordered this one do I have to attach my own connector? It seems like you got the wrong item. Contact customer support and they can get the issue resolved. Why the hell does another xbee with with 1600m haves the same price as this, with 10km? Does anyone have any real world experience on the range of these? I want to transmit line of sight, except one wall at my end, for 4km. Has anyone done this? If so, what antennas did you use? Capable of point-to-point, peer-to-peer and point-to-multipoint networking, the XBee-900 XSC is ideal for solutions where RF penetration and absolute transmission distance are paramount to the application. I'm confused. Is this the xsc model? What they don't tell you is that the board is the same with all the modules. If you don't like the antenna mount, you can change it. For instance, if you have the model with the RPSMA, but if decide you want to use a small onboard antenna, you can just insert a wire antenna into the hole on the board. You might need to desolder the old RPSMA connector. 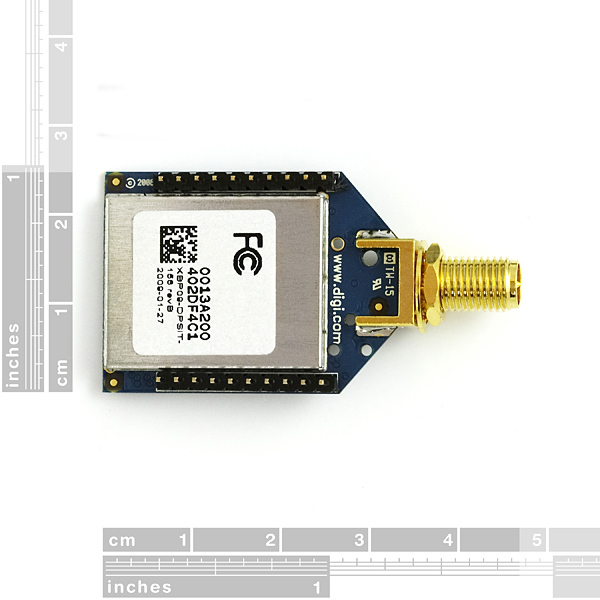 I just ordered a couple of them, the problem is the Antenna... Any little, tiny, small 900mhz antenna suggested? Got a pair of these for a remote timing display. With a pair of directional antennas, got well over 300 yard range. The only downside is it won't run for more than a couple of hours on a 9 volt battery. (The adapter board I'm using runs on 5 to 9 volts.) Going to try a USB 5 volt power source, and see what happens. Best item fulfilled all need. Greetings. Sorry to hear you are having issues with your Xbee modules. We are happy to answer any questions you may have and have contacted you personally via E-mail to try and resolve your issue.